The nuvi 7×5 lineup is a close descendant of the 700 series, a Rated4Stars Top Pick, which we review in detail here. Frankly, we were wondering what Garmin could have added to the 7×5 series in the way of must-have new features, given that the 700 and 800 series seemed to have it all. We were pleasantly surprised to see that the new features are not only solid navigation improvements (as opposed to electronic “bling” like a photo album viewer), but also compelling improvements that make the 7×5 models more than an incremental advance. 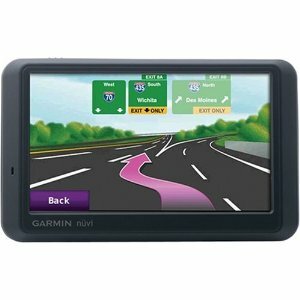 New to the nüvi 7×5 lineup is Garmin’s HotFix satellite prediction (which locates your position quickly and precisely), Lane Assist (which provides lane guidance and junction views when possible), automatic time zone transitioning, and 3D Building views as well as Garmin Connect Photos to help you visually ascertain your position. Additionally, the nüvi 765T includes Bluetooth connectivity to your cell phone and free real-time traffic updates from Navteq (for the life of the device) via the included GTM 20 traffic receiver. Though GPS systems are terrific at guiding you down the highway, when it comes time to exit, it’s not always clear what lane you should be in. The 7×5 changes that with its new Lane Guidance feature which clearly shows you what lane you should be in for upcoming turns. But it gets better. The unit’s 3D Lane Assist Junction View displays a photo-realistic view of the road detail ahead, including the highway signs as you’ll see them. Thoughtfully, the irrelevant signs are visible, but faded, so the signs you need to pay attention to stand out. Owner reviews praise the feature, the only negative being that the detailed view is not always available. We expect that will change with future map updates. We humans are visual creatures — that’s why we often give each other directions sprinkled with large, visible landmarks…especially buildings. The 3D Buildings feature can display buildings on the map to assist your navigation, some of which are displayed photo-realistically. At last! We’ve always wondered why a GPS unit, which always knows where you are and what time it is, couldn’t automatically set your time zone. Now it does. Thank you, Garmin. If you’re far from home in an unknown city, youneed to know where you’re going before you leave the curb. That can sometimes meanwaiting several minutes for the GPS to get a satellite fix. Garmin’s HotFix capability automatically calculates and stores satellite locations, significantly reducing satellite acquisition time. With HotFix, your nüvi remembers the position of all satellites it is tracking when you turn it off, and calculates their movements in order to predict where they should be the next time you turn it on. HotFix can predict satellite positions for up to 3 days after the device was last turned off. .
Where Am I? Where’s My Car? The nüvi 7×5 series can answer both “Where am I?” and “Where’s my car?” With a single tap you can display your exact latitude and longitude, the nearest address and intersection, and the closest hospitals, police stations and gas stations. Can’t find your car in the parking lot? The 7×5 units automatically mark the position where they were last removed from the mount. We’ve manually marked the position of our parking place in the past when we anticipated a difficult hunt for our car. But having the unit do this automatically means you don’t have to remember…just enjoy the game. We’ve just covered some of the new features in the 7×5 series, but in addition you’ll also find the same rich feature set as the 700 series in a compact, stylish and very portable high-quality package. Ready to Use Out of the Box? I got one of these. its nice and practical.